St. Thomas' Anglican Church is offering scholarships to students from 15 years old and up who wish to join Saint Thomas' Senior Choir. The students must be attending high school, college or university, or currently pursuing serious professional course. A Choral Scholar experience is a rewarding experience that can influence all students, no matter what career they choose to pursue later on. Saint Thomas' Senior Choir is a mixed-voice ensemble, that performs sacred music from all periods, with a special emphasis on the great classical repertoire. Renaissance motets are regularly performed at St. Thomas' Church, both for the Sunday services, and special events of the music series such as Choral Evensong, the Festival of Nine Lessons and Carols and the Easter Festival. "There is something special about music performed within the context liturgy. It is a unique experience, because the music, the symbols, and the rites all enrich each other," says music director Francine Nguyen-Savaria. "Wagner said that opera was total art. I think liturgy is, too. Perhaps even more," adds music director Matthieu Latreille. The Senior Choir is part of Saint Thomas' Choral Academy, which is shaped after the model of English Cathedral choirs. Choristers read music, using solfege (tonic solfa), the most popular approach to sight-singing taught in music schools and universities around the world. 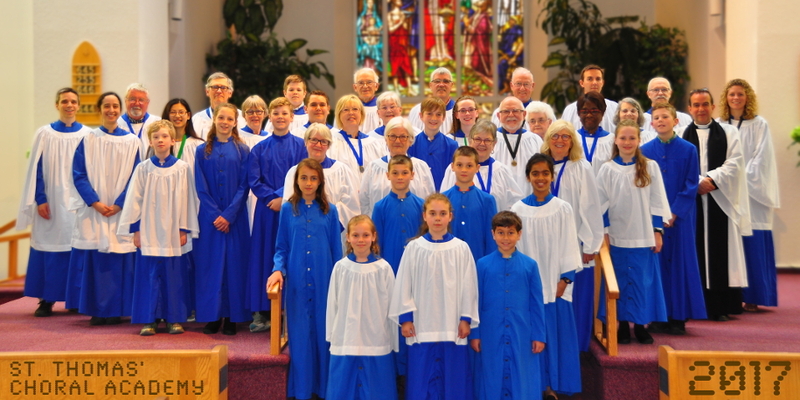 Saint Thomas' choirs welcome all singers regardless of their origin, gender, sexual orientation, economical circumstances, faith and beliefs, as long as they wish to sing sacred music and are comfortable within the Anglican setting. Scholarships vary, according to the musical abilities and experience of the students. All are welcome to apply. We are looking for potential, a desire to perform music seriously, and a good ear. To apply, students must send a letter explaining why they wish to join Saint Thomas' Choir, and how they are planning to use the scholarships. Selected candidates will be contacted for an audition / interview. Please feel free to contact the music directors with any questions you may have.